A new housing development near downtown has the potential to be the largest green project of its kind in city history. Plus, Sungevity's lease-a-solar-system blasts off. 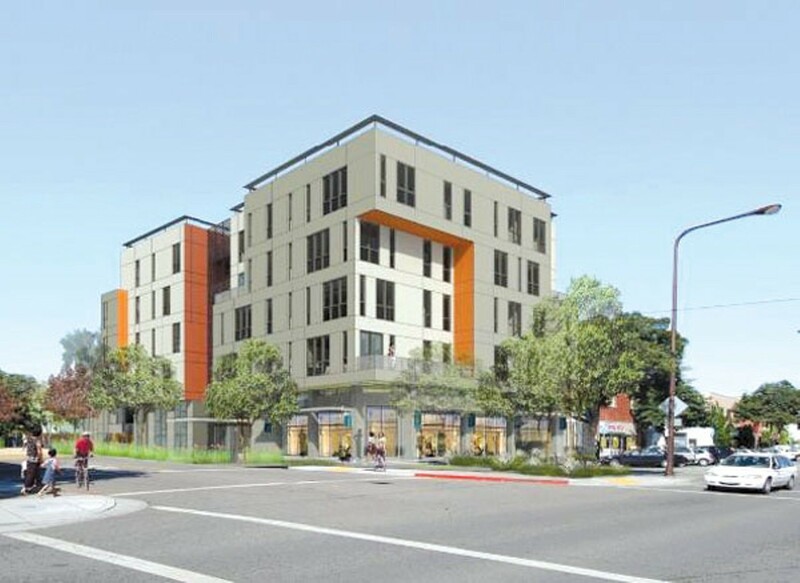 The developers of Parker Place in Berkeley are shooting for LEED-Platinum certification. Environmentalists increasingly realize that one of the most effective ways to fight global warming is to build dense housing developments near major transit corridors. And Berkeley has taken another step in that direction with the recent approval of Parker Place development on Shattuck Avenue, just south of downtown. The CityCentric Investments project will include five-story buildings and 155 condos and apartments and will house 300 to 350 people. It's also directly on AC Transit lines and just a short walk from the downtown and Ashby BART stations. Parker Place residents also will receive free transit passes, and access to car sharing, 120 bike parking spots, an on-site bicycle repair shop, and electrical plug-in stations for electric cars and plug-in hybrids. And the project will feature drought-tolerant landscaping and rainwater reuse, including an on-site retention pond for irrigation. "The project has the potential to be Berkeley's largest privately developed project to receive LEED Platinum certification," said CityCentric principal Mark Rhoades, a former Berkeley city planning manager. Parker Place, designed by award-winning architects David Baker and Partners, also gets green credits for adaptive reuse. The housing will be built atop the old Berkeley Honda building at the corner of Shattuck and Parker Street, originally designed in 1923 by noted Berkeley architect James Plachek, who also designed Berkeley City Hall and the downtown Berkeley library. Berkeley Honda, a tenant on the property, plans to move to another location in the city and is actively seeking a new home. The old dealership building, with its distinctive walls, will serve as part of 22,000 square-feet of street-front retail along Shattuck and Parker. "Our vision is to really create a sense of place and transform this section of Shattuck," Rhoades added. The housing development will extend across Parker to the current dealership parking lot, and will feature 31 affordable units for people with disabilities. The price of the affordable units will run between 30 percent and 60 percent of the area median. The other 124 condos and apartments will be market-rate housing, from studios to three-bedrooms. The development will be at its tallest — 65 feet — near Shattuck and then gradually step down along Parker so that it won't be out of character with the adjacent neighborhood of single-family homes. The project has received almost no opposition, not only because it will be one of the greenest in city history, but because Rhoades and his business partner, Ali Kashani, conducted extensive outreach in the community. In fact, in a city infamous for its Byzantine bureaucracy and a permit approval process that can take years to navigate, Parker Place won full city entitlement in just sixteen months — a Berkeley record for a development of that size, Rhoades said. The 60,000-square-foot project also won unanimous approval from the Berkeley Zoning Adjustments Board, and has been endorsed by Greenbelt Alliance, an environmental group that advocates for smart growth, and TransForm, a public-transit advocacy organization. The one possible eco-drawback of the development is that it may end up with too much underground parking, thereby spurring residents to use cars instead of walk, bike, or take mass transit. CityCentric is planning for up to one parking space per housing unit. However, as a disincentive to cars, the company intends to charge residents extra if they want parking. It also does not plan to actually construct the parking spaces until it can determine how many residents will pay for them. Because of the continuing downturn in the housing market, CityCentric plans to rent the units as apartments for now, with an eye on turning them into for-sale condos when things turn around. "We've already had a lot of inquiries from people who want to invest or partner with us," Rhoades said. "We've also received a lot of calls from who want to live there." CityCentric has not yet decided on how much the market-rate units will rent for. When Sungevity launched its solar-lease program, it soon became clear that the Oakland company had a struck a chord. "Since March 1, we've sold as many solar installations as we in did in all of 2009," explained Sungevity co-founder and President Danny Kennedy. The reason? The solar-lease program is simple and affordable — and it saves homeowners' money, particularly those with high energy bills. All you do is go to Sungevity's web site and type in your address, and within 24 hours you receive a free iQuote. Sungevity uses satellite mapping to scope out your location, roofline, and property to determine how much sunlight shines on your roof, what size solar installation you'll need, and how much it will cost you each month. You don't actually buy the solar panel system; you lease it from Sungevity for ten years — with an option to extend for another five. You also don't need to put any money down. Instead, you receive a bill each month for the cost of the lease. If using solar power significantly lowers your monthly electricity use, then the price of the lease coupled with your new lower PG&E bill could end up costing less than what you would have paid normally each month. Kennedy said the average customer saves about 15 percent in total out of pocket expenses each month. However, he acknowledged that the lease program makes the most financial sense for residents living east of the hills where there's less fog in the summertime and more people use air conditioning. Still, even if you live on the west side, from Richmond to Hayward, you might be willing to break even or pay more each month to do your part in reducing greenhouse gas emissions. An earlier version of this story contained an error in the photo caption. The developers of Parker Place are shooting for LEED-Platinum certification, but the housing complex has not yet received such certification. California's signature environmental law needs to be reformed because NIMBYs are using it to block smart growth.